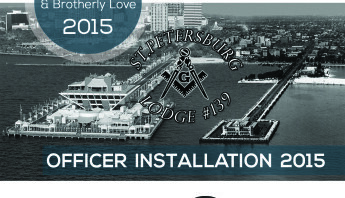 Home - St.Petersburg Lodge 139 F. & A. M.
St. Petersburg Lodge No. 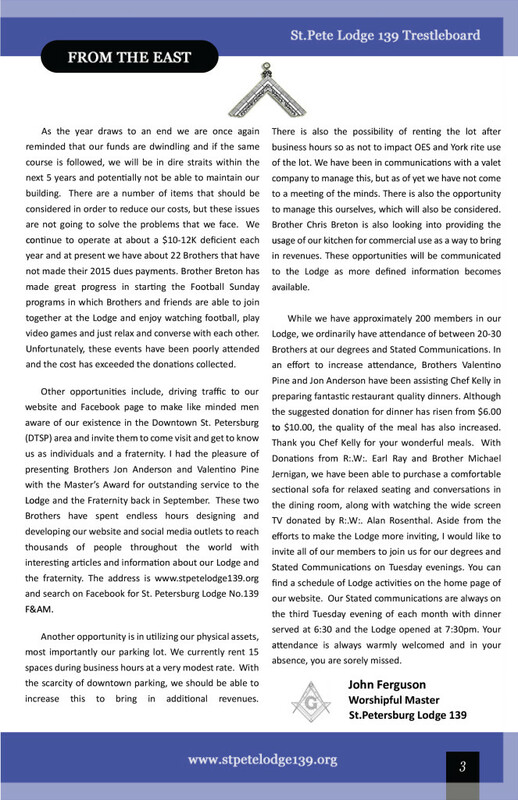 139 F. & A.M.
St. Petersburg Lodge No. 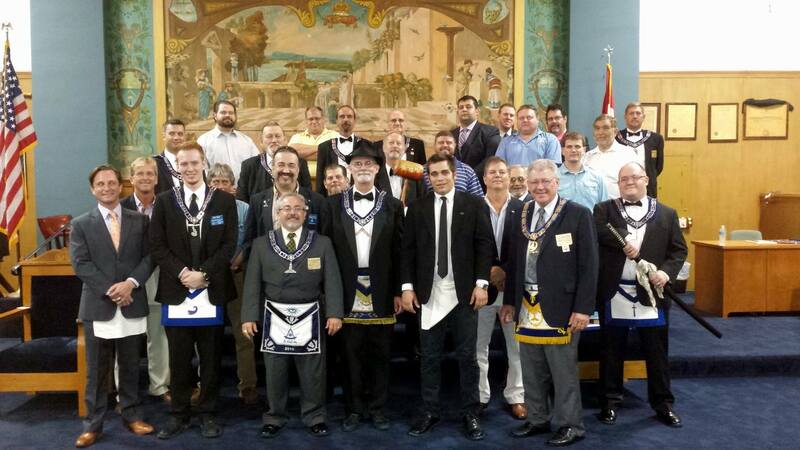 139 F. & A.M. meets at 3325 1st St NE, Saint Petersburg, Florida, USA. We are ideally situated in beautiful downtown St. Petersburg, near the night life, restaurants and hotels. 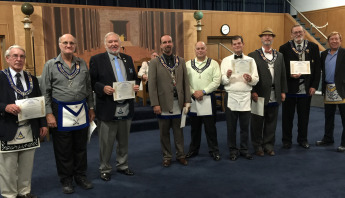 The Center performs its main function of being a meeting place for Masonic Organizations every Tuesday, Thursday and Friday evenings. 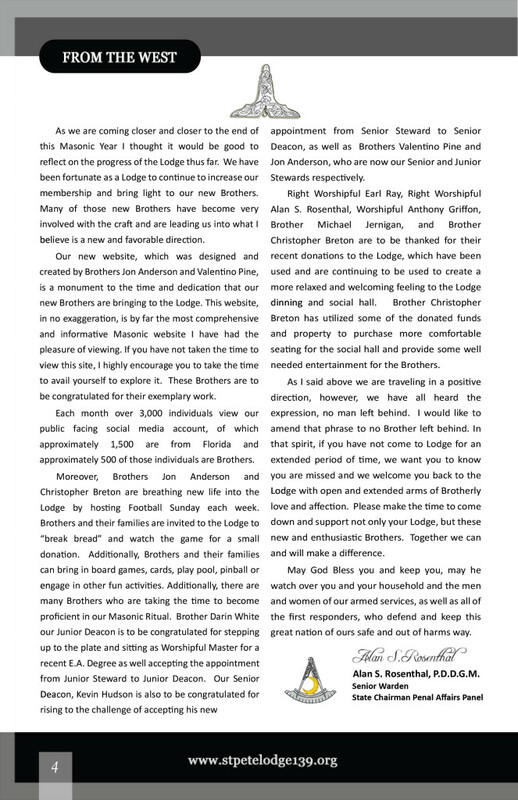 St. Petersburg Lodge No. 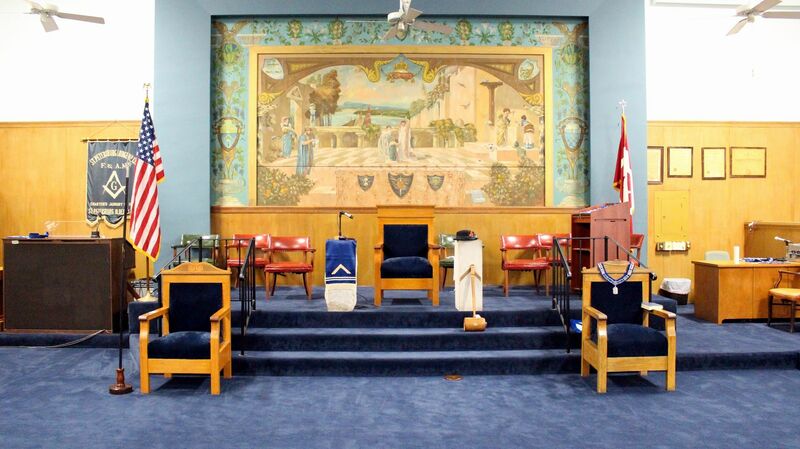 139, Free and Accepted Masons meets on Tuesday evenings, Eureka Chapter No. 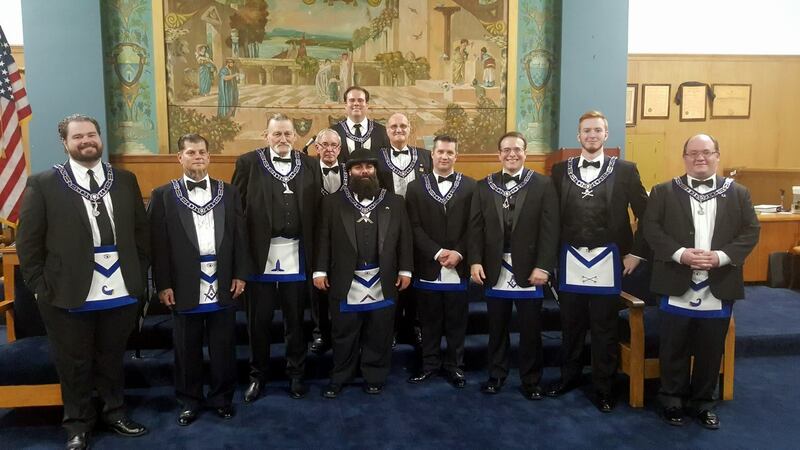 5, Order of the Eastern Star meets on Thursday evenings, and the St. Petersburg York Rite Bodies meet on Friday evenings. Hello wanderer! 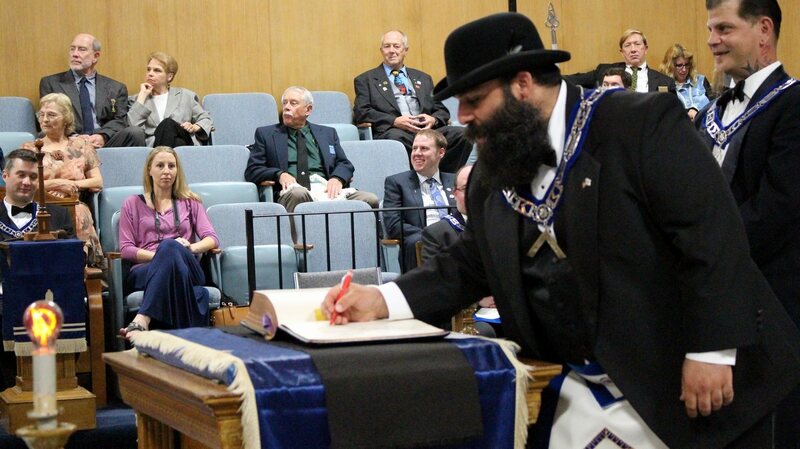 You’ve reached the online presence of a Masonic Lodge! 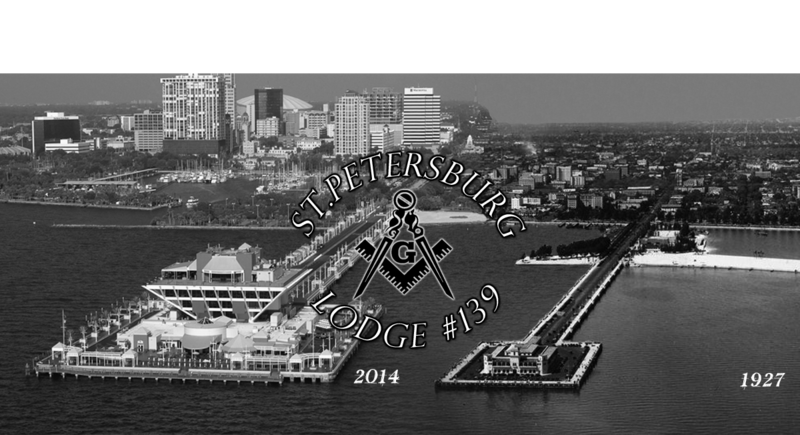 Not just any Masonic Lodge but Saint Petersburg Lodge 139, the metaphysical mother lodge of the Saint Petersburg, Florida area. 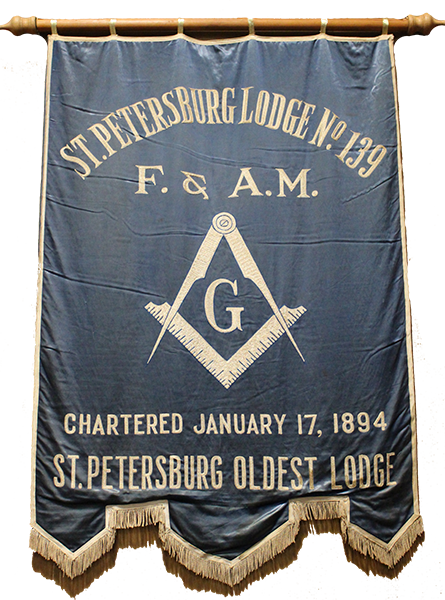 Saint Pete 139 is the Genesis of Freemasonry in our part of the County and she is as old as the beautiful city of Saint Petersburg herself! We were chartered in 1894 by a band of cowboy philosophers looking to leave the world a better place than when they came into it, and that is just the beginning of our story. Our destiny as Freemasons is to be the builders of society, temporally as The Ancient Craft has been in the past as well as speculatively and philosophically. 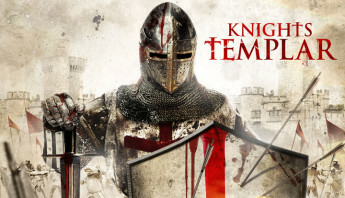 The roots of Freemasonry stretch back tens of thousands of years, before the Cowboys of the wild west, before the founding of The United States of America, before the Knights Templar of the high medieval ages… all the way back through time to the building of King Solomon’s Temple. In those ancient times Freemasons were “Operative”, meaning that we actually constructed the great structures and wonders of the world. 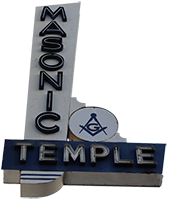 Freemasons were master builders that had unlocked the secrets of mathematics, geometry, trigonometry and early physics pertaining to the materials with which they built the great temples, cathedrals and castle of the world. This secret knowledge served The Craft well in its trade for centuries, and as the demand for the skills of the Freemasons grew, so did their knowledge. 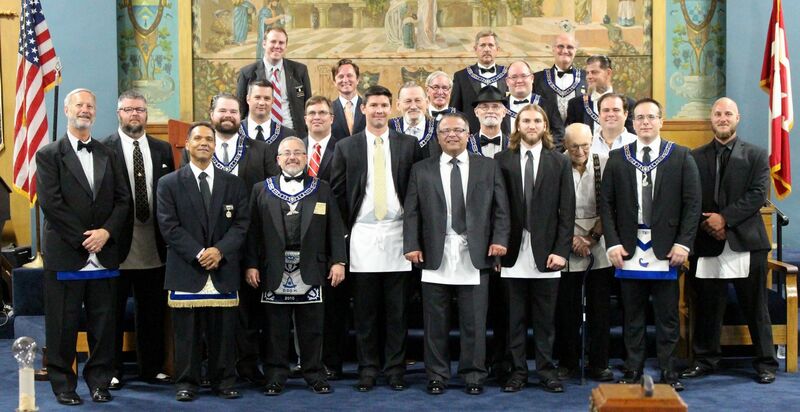 As Masons journeyed out across the known world to build their great works, they encountered other aspects of ancient mystery schools and preserved those various flavors of knowledge and wisdom within their own rituals and ceremonies. Worshipful Master and Commander in Chief of the Continental Army George Washington was not present to sign the declaration of independence because he was a bit busy at the time preparing to defend Manhattan and New York against Major General Sir Knight Henry Clinton. Many more founding fathers were also famous Freemasons but they are too numerous to list here. Now if we continue on our journey forward through time we find Brothers James Bonham, James Bowie, David Crockett, Almaron Dickenson and William Barrett Travis caught up in the famous battle of The Alamo! On March 6, 1836, one hundred and eighty-seven men under the command of Brother Travis were defeated by several thousand Mexican soldiers lead by Brother and Mexican General Santa Anna (who was also a Freemason). On July 4, 1976, the Grand Lodge of Texas placed a bronze marker at the Alamo, honoring the Masons who died there. 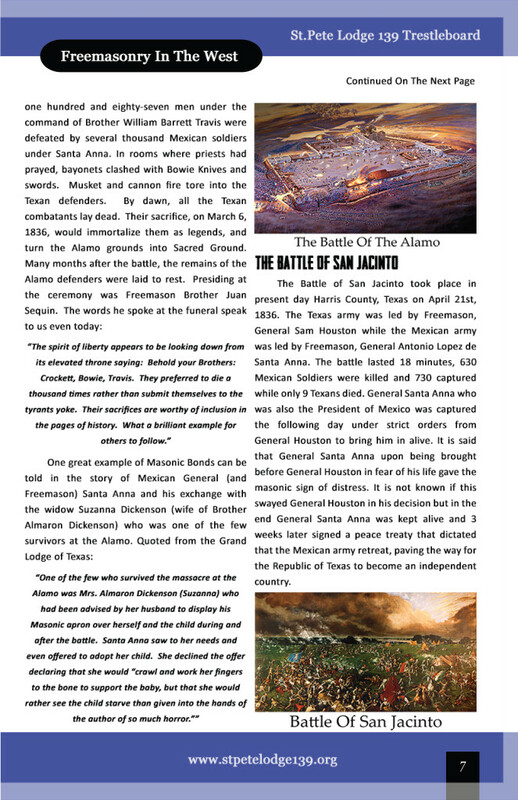 During the following battle of San Jacinto, American forces led by Brother General Sam Houston defeated Brother General Santa Anna in a swift and decisive battle which lasted only 18 minutes. Brother General Santa Anna who was also the President of Mexico was captured the following day under strict orders from General Houston to bring him in alive. It is said that Brother Santa Anna upon being brought before General Houston in fear of his life gave the masonic sign of distress. 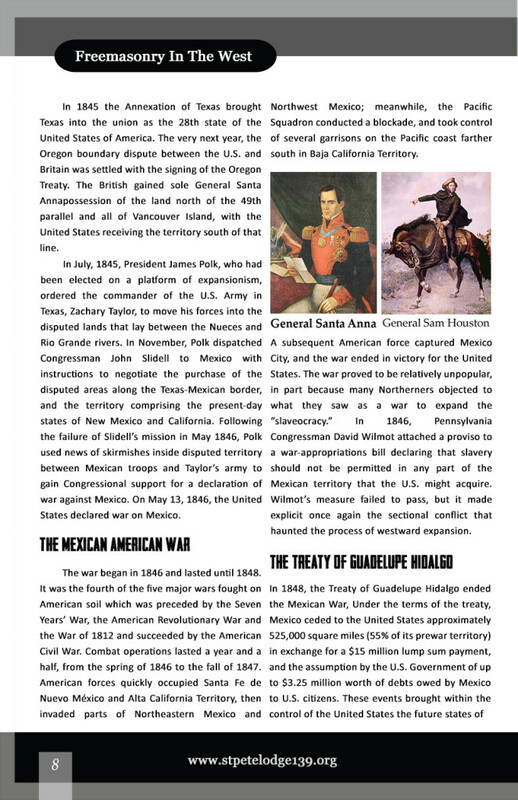 In the end General Santa Anna was kept alive and three weeks later signed a peace treaty that dictated that the Mexican army retreat, paving the way for the Republic of Texas to become an independent country. 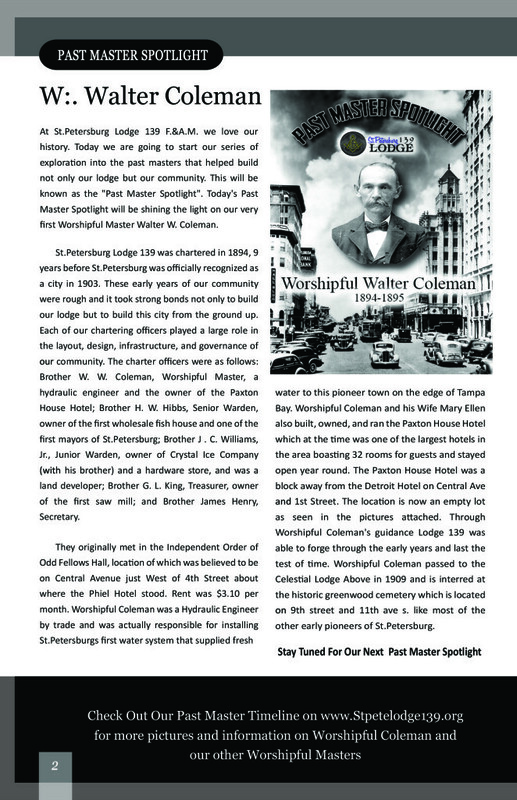 Brother W. W. Coleman, Worshipful Master, a hotel owner. Brother H. W. Hibbs, Senior Warden, owner of the first wholesale fish house. Brother J . C. Williams, Jr., Junior Warden, owner of Crystal Ice Company (with his brother). 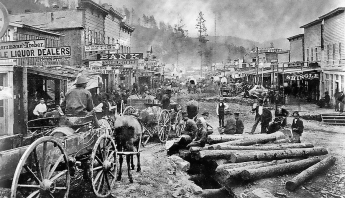 Brother Williams also owned the hardware store and was a land developer. 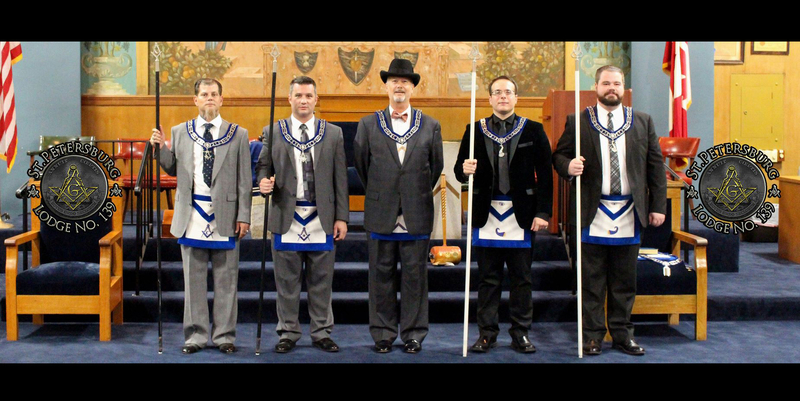 Freemasons are “Traveling Men” always seeking light and knowledge. As the famous writer and philosopher J.R.R. Tolkien once wrote, “All that is gold does not glitter, Not all those who wander are lost; The old that is strong does not wither, Deep roots are not reached by the frost”. 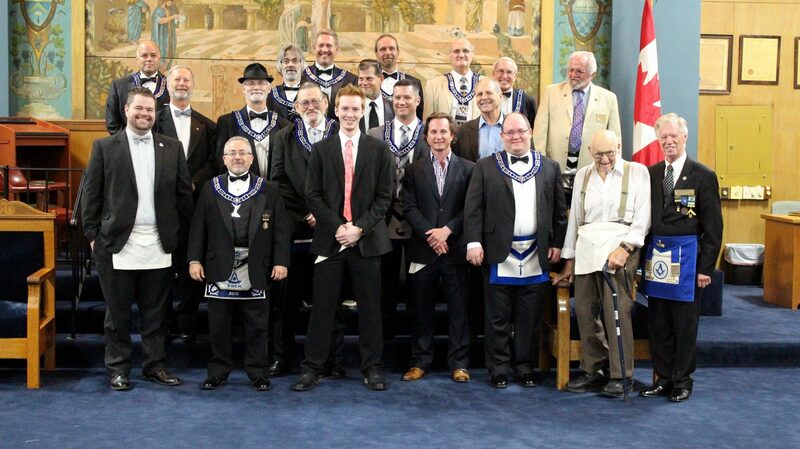 If you “wander” in this life but wish to become a “Traveler” instead of merely a “wanderer” then we encourage you to consider becoming a Freemason. Travelers seek the light and have a purpose, a moral compass and a direction. 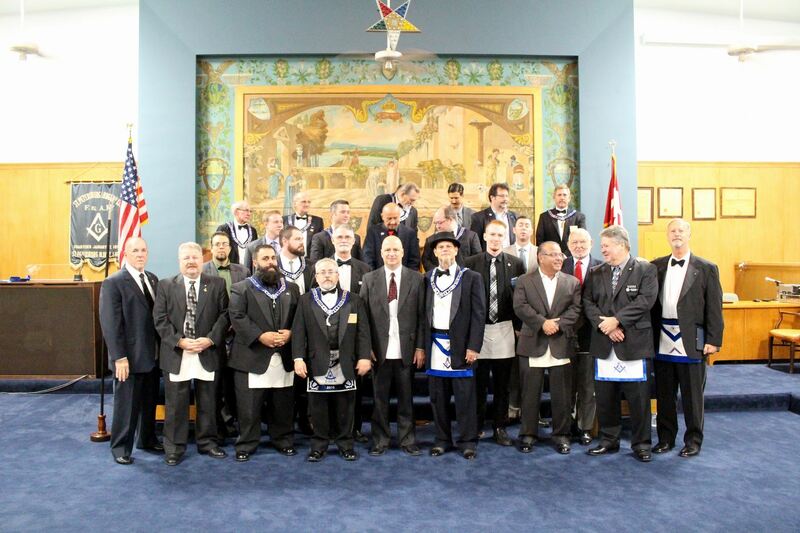 We Freemasons are a global Brotherhood of Noble and good men. 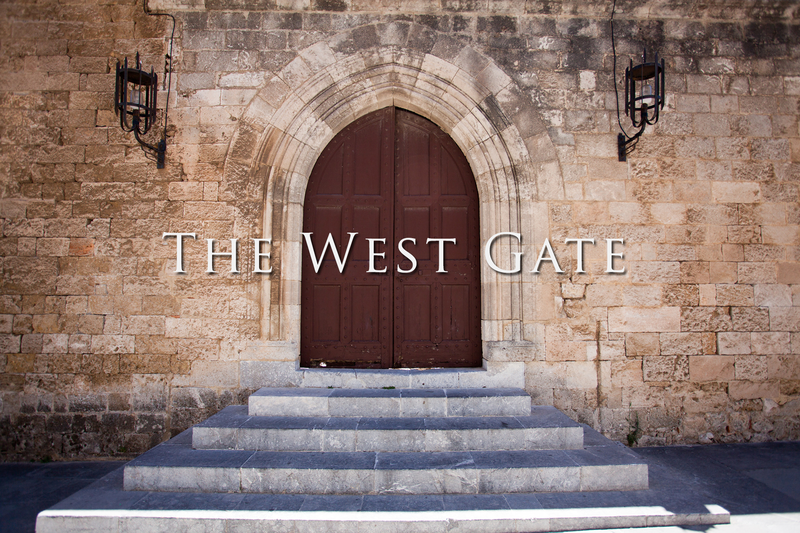 We are an ancient order whose goal is to shape and build society for the betterment of all mankind. We are the keepers of knowledge, wisdom and light, and we embrace men young and old who are the seekers of these precious jewels. 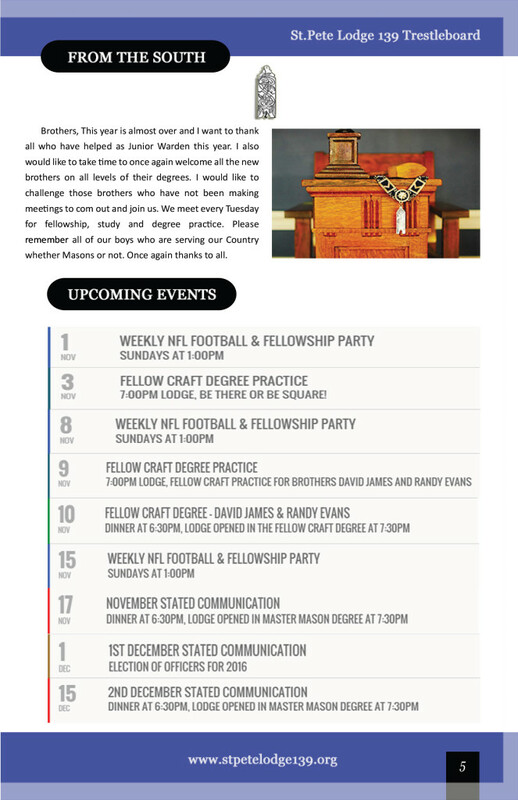 If you are interested learning more about Freemasonry please check out our “Masonic History Page”. 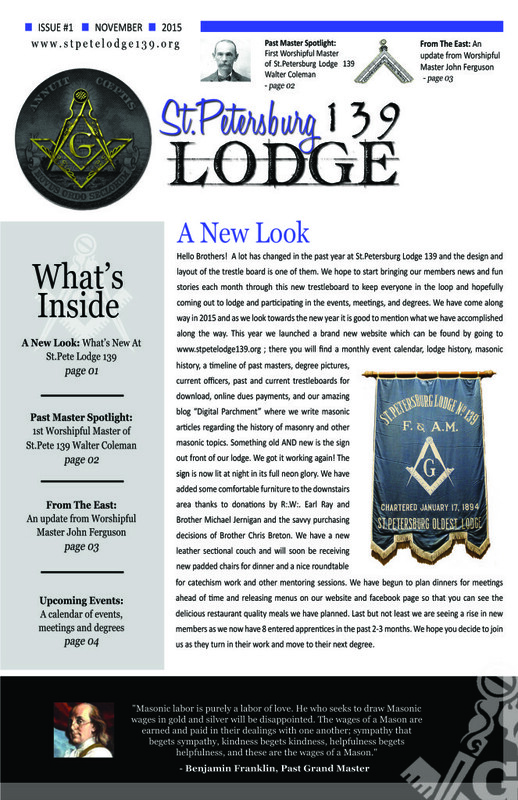 If you want to know what it takes to become a Freemason, please take a look at our “How to Become a Freemason Page” in the drop down menu, under “About 139”. Have fun exploring our website! Down the rabbit hole you go!